The crust crackles as it collapses into the juicy chicken meat. There’s the faint twang of buttermilk and a crackin’ black pepper that dances dixie on your taste buds. 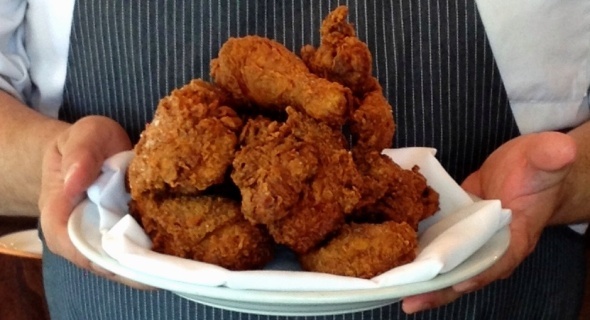 Perfect fried chicken is a hard-to-find delicacy outside of your home kitchen. Few restaurants take to it with the fever that now possesses Thomas Boemer chef and co-owner of Corner Table. His next restaurant, along with front-of-house partners Nick and Chenny Rancone will be a down home spot called Revival in the former Corner Table building, where the star attraction will be his fried chicken. Slice between the leg and the body of the bird, working with the muscle. Cuts around it to the where the bones meet. To separate the thigh, bend the leg, looking for exactly where the joint is. Use your knife to slice through the joint. Repeat the process with the other leg. Removes the bird’s backbone with kitchen shears. Snip down either side with the bird skin side down on the cutting board. Discard the backbone (or reserve for stock later). Using the boning knife cut directly down the center of the breast bone to the muscle, making smooth slices until the breasts are split. Remove the wings from the breast, as you did with the legs,, working with the natural musculature to find where the pieces are best separated. Use the kitchen shears to separate the breasts into the desired number of pieces. Now, you are ready for making some fried chicken. Make a brine of 1 quart buttermilk, 1 tablespoon plus 1 teaspoon salt, 1 teaspoon black pepper and 3/4 teaspoon paprika in a large container. Add chicken pieces and cover. Allow to sit at least six hours or overnight in the refrigerator. Heat the oil to 350 in a large cast iron pan or Dutch oven. Boemer recommends using a very large bowl for the dredging and he prefers bread flour for the heavenly crust we’re all craving. Into the flour goes more salt (probably a little more than you would think it needs), fresh black pepper and paprika. His sous chef Kyle Bultinck approves the mixture, having spent time in the kitchen of Art Smith (aka Oprah’s favorite chef) and said Chef Smith uses a very similar technique to what they’re doing for the forthcoming Revival. When the oil is ready, toss the chicken in the flour mixture and shake off excess. Gently lay it into the oil and cook until desired doneness, when the skin is a deep, rich brown. Drain on a cooling rack. “Never on paper towels—you will kill the crispy,” the chef orders. The result is so breathtakingly simple and heavenly to taste. We all stood, hungrily, over the plate nibbling at first, and then inhaling piece after perfectly fried piece of chicken. It was then that Nick Rancone wandered over and mentioned a recent dinner at a world renowned restaurant where they didn’t put any vinegar on their greens. This launched the kitchen into a collective rage. Never mess with tradition. Look for Revival to open mid-summer serving what might just be the best fried chicken in town.